Ham and Cheese Casseroles takes comfort food and makes it healthy! Such a hit with our kids too. Steam the cauliflower and broccoli until cooked through and tender. 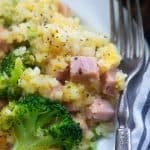 Add the steamed cauliflower rice and broccoli to a large bowl with the ham, 2 1/2 cups cheddar, egg, and spices. Stir well to combine. Spread mixture into 9x13 baking dish and sprinkle the top with remaining 1/2 cup cheese.